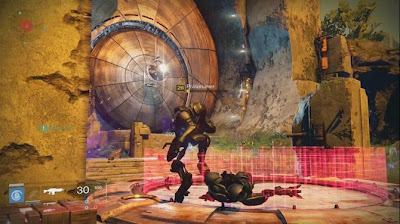 Raid "The Transparent chamber" in Destiny consume a bunch of ammo. Since it is helpful to previously well equipped. Take synthesized in an emergency a few ammunition packages. On some points in the raid, it is important to create a lot of damage in a short moment. These two weapons classes are great. If everyone has both the process of ammo shortage is not a problem. In the first section it goes straight to the point. You have three circles similar to rule and take hold. As long as you control all three circles, the tower, which opens wide the door grows. The only enemies that are dangerous are the Praetorians. When they enter the circle, you have to recapture them. Important: The Praetorian can appear on both sides of your circle! Follow the path. In the way down you should make sure that your fall-take damage, if you will not cushion landing by a double jump. The Templar requires three actions. In the first sequence is about to weaken the Templars. For this you need two towers. Similarly as in the first section, they must be guarded. Keep the fanatics of it from your tower to attack with emptiness. Takik: Shapes 2 groups, each with 3 keepers. Each 3 guardian guarding a tower. Important: The fanatics leave a green soup made void. If you have been marked by this, you have to fast in the center of the map and put you in the white light. Unfortunately, this is not consistently active! Once the three towers (Pillar) are ready to dive to the oracle. These are small yellow-white balls that produce a bell-like sound. The oracle may see not dangerous from, but they have it in them. If you do not destroy fast enough, mark you with emptiness, which means that you have to clean in the middle of the map you again. Tactics: Again, you should take a 3-2 he split groups and try to position yourself so that you have so many possible appearance-points of the oracle as possible in view. Important: Since appearing on the floating platforms on the left and right side of the card Sniper Hobogoblins, each should keep this in mind and out of the way a guardian. Therefore, the outer two teams should work very concentrated. As soon as the oracles were defeated, immersed in the center of the map on a relic. It is a sign, like the sword out of the story mission on the moon. A guardian must now add this tag. Tactics: shield-bearer, the task while killing enemies with the melee attack until his super bar is full. Now he should announce that he shoots with the super-attack on the Templars. Subsequently, the Shield of the Templar is disabled for a short time. During this time, all much damage as possible trying to create. The other players must not only kill enemy waves fills his super-block while the shield-bearer. Also oracle reappear and must be destroyed so that no one is marked by emptiness. Important: If someone is marked by emptiness, plate holder, clean it with his shield. Very important: The oracle may not gain the upper hand, otherwise all die guardian in one shot! The Gorgons are shining agony like creatures that can kill you in one shot. Tactics: Attempt at all costs to avoid contact with the Gorgons! Important: They are relatively blind but not deaf! Avoid jumping close to them, because they perceive that sound. This section is very entertaining. First of all guardians must down to the edge. The platform that will help you to bridge the way, keep disappearing. At the bottom you walk along the wall. Important: At one point, the floor is missing! Here you have a double jump around the edge make it so you do not crash. Tactics: If the lower portion crashes someone, you can revive him. So do not start from the top one. Welcome to the glass chamber! In the first step you have two legacies of the past procure. These are hidden behind two dimensional portals. Before you can even use the portals, the gatekeeper must be killed. Tactics: Kill the gatekeepers directly from the entrance. If all the same time shooting with sniper rifles at him, he's done before he can walk on the map back and forth. If the goalkeeper destroyed, you open a portal. For this purpose, the guardian must provide in a circle around a pillar. However, as in the very first section come here again opponents who want to close the portal. Two guardians enter the portal while the other four are trying to keep the site running. In the portal, you should run to the enemy and kill the gatekeeper right past ancestors. With rocket launchers that goes very fast. Now a guardian picks up the artifact (another sign), and both left the portal. The same now in the other portal. Did you two shields (relics) they disappear and start the fight against Atheon (final boss). Important: If someone is marked by emptiness, remember that you can clean it with the shield. To defeat Atheon, you have to split you again. But this time it is not done voluntarily! Tactics: As soon as they arrived there, a keeper grabs the relic (shield) and has in the center of the map, to complete all enemies with the shield. The jump attack is very helpful for this purpose. The other two guardian must destroy the oracle again. Make sure that it has to be fast and shapes you the appearance-points of the oracle good one! If the oracle to get the upper hand, all die. The players who are not in another dimension, must see to it that the portal remains open. The Piller are again responsible for ensuring that each portal remains active. Tip: The players are warped, should inform their colleagues, which portal they need. Gets "green" for Venus and "brown" for Mars. "Green" is the right portal and "Brown", the left portal. Once the three dimensional travelers are back, all players stand on the average floating platform and shoot the protection of the shield on Atheon. Pay attention to the timer! There are only 2 seconds left, you should quickly leave the platform, on the other hand puts her a hard hit. Important: In another dimension it will happen that the oracle Hunter are marked by emptiness. Therefore remains close to each other so that the plate holder, you quickly cleaned.